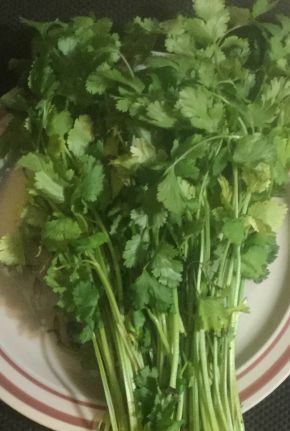 Cilantro is an herb that pairs well with Mexican dishes mainly but can also be used in Middle Eastern or Indonesian dishes. But if you are anything like me you can't use up a bunch of cilantro before it goes bad. I use it in cooking but not that often. 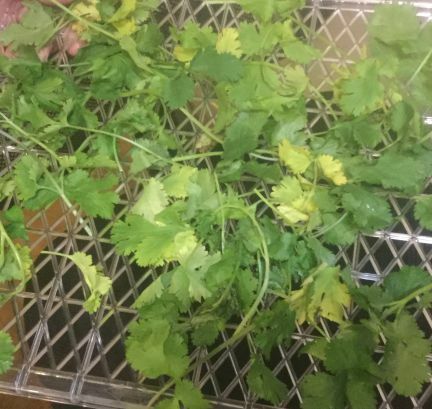 I hate wasting it and I hate having to run to the store when I need it so I dry the cilantro and store it so I have some on hand whenever the need arises. The first thing you need to do is thoroughly wash the cilantro. I use some vinegar and water and soak the cilantro for a few minutes and then rinse it under cool running water to make sure all the dirt and residue is off the cilantro. Once they are rinsed be sure to gently shake the bunch so most of the water is removed. Now lay the cilantro onto your dehydrator trays. I leave the stems ON but you can remove them if you prefer. I keep them on because most of the flavor comes from the stems. Set your dehydrator to 110 degrees and let it run for 3-5 hours. They dry fairly quick but don't worry you can't exactly "overdry" them. They are considered "done" when the leaves are completely dry and kind of "crunch" when you pinch them. Store the dried cilantro in an airtight container like a small canning jar. Store in a cool, dry place until ready to use. They should be used within a year. The flavor and aroma is intense so don't listen to the naysayers who say drying the cilantro loses its flavor. Just open up a jar that you have dried a few days after you store them and you will see what I mean. I store my cilantro whole and do not crush or grind them down until right before I need them. This keeps the flavors intact. Besides the ethnic dishes I mentioned earlier, cilantro can also be added to soups for a punch of flavor. At our house, we are big pizza lovers. We have pizza night every Friday night and it is NEVER take-out...it's always made fresh, from scratch. Sometimes we just make a "regular" pizza but we like to mix things up a bit and try a Fresh Vegetable Pizza or a Homemade BBQ Chicken Pizza. Today, we made this Classic Hawaiian Pizza and it was a real crowd pleaser. This delicious pizza started with my homemade pizza crust and homemade pizza sauce and finished off with 2 kinds of cheese. It truly was "love at first bite"! My homemade crust makes a light, soft dough that almost melts in your mouth. It is chewy and puffs up beautifully when baked and has just enough of crunch. To begin with, take your pizza dough and roll out and place onto a pizza pan. I do highly recommend using homemade dough and homemade sauce. They really do elevate your pizza from great to extraordinary. Clicking on the links in the recipe will direct you to my recipes so be sure to check them out. Take the extra virgin olive oil and spread it out on top of your crust as you would do pizza sauce. Now, take your pizza sauce, about 1/4-1/2 cup depending on your preference, and spread it over the crust. Take a handful of your mozarella cheese and sprinkle it on. The Canadian bacon we purchased was for sandwiches so we had to cut it up into bite sized pieces first. Place the pieces onto your crust. Now place on the pineapple. To be honest, the pineapple chuncks were too big for my liking so next time I may buy crushed pineapple and see how that works. Finally sprinkle on some more Mozarella. Place into a preheated 425 degree oven for about 12-15 minutes. It is done with the crust is golden brown and the cheese is melted and bubbling. Remove from the oven and sprinkle on Parmesan cheese and enjoy!